Each year, I am lucky enough to be invited to a special post holiday dinner with fellow wine lovers from the Washington D.C. area. We each bring superb wines. This holiday dinner – in January 2014 – was no exception. Below the notes to the dinner, as published previously on Cellar Tracker. 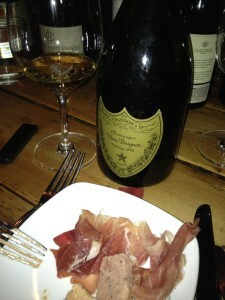 Be sure to check out notes from Kevin Shin, who also attended this great dinner! A nice way to start 2014. 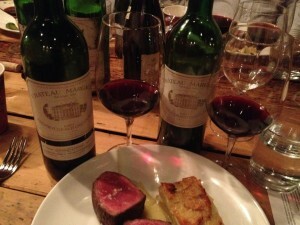 With recent talk about Bordeaux losing its charms for the valid reason of excessive pricing that has been alienating customers, not to mention a trio of middling to poor harvests (2011, 2012, 2013) and the search for alternatives, some people are saying that Bordeaux is a “turn off” or out of fashion. Read this recent text from wine-searcher, for example: http://www.wine-searcher.com/m/2014/01/ … ge-problem. 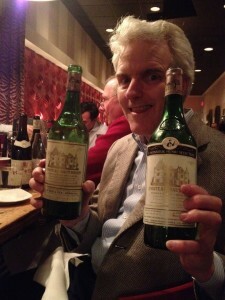 But thanks to Ken Brown, a group of fellow tasters and friends I have known now for some 10 years gathered for a post holiday dinner of great wines in Washington D.C., following which we can safely say that Bordeaux is most certainly not a turn-off – and will not go out of fashion any time soon. Oh, yes, we had superlative Champagne and Burgundy and Port, too. Many thanks to Ken Brown (70 Haut Brion, 99 Mugneret-Gibourg Echezeaux), Ken Barr (69 Jaboulet-Vercherre Chambertin, Climens 88, 77 Dow Vintage), Howard Cooper (90 Montrose, 77 Taylor Fladgate vintage), Paul Marquardt (89 Margaux, 85 Krug), Kevin Shin (83 Margaux, Old NV Moet & Chandon Saran Blanc), David Zimmerman (85 Dom Perignon, 71 Haut Brion) and Randy McFarlane (02 JJ Confuron RSV, 10 Hudelot Noellat RSV). 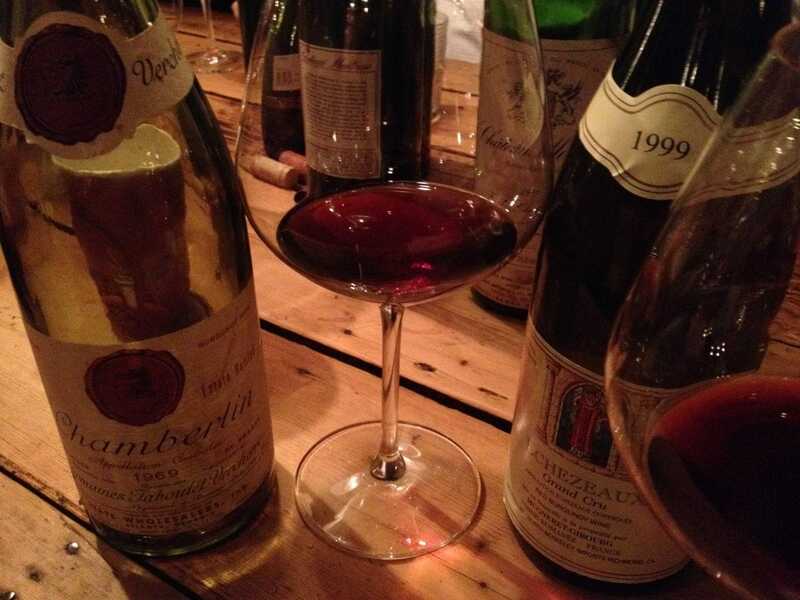 Not just for the wines that they brought, but for the continued friendship and camaraderie which makes life sweeter – and not a bad way to kick off 2014! 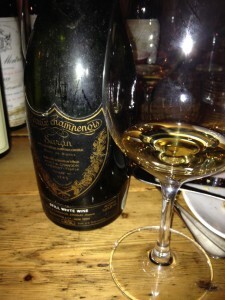 On a recent Facebook exchange, Ebbe Bonde Soerensen dubbed Dom Perignon the “Coca Cola of Champagne”. Tasting this, I do not see his point . 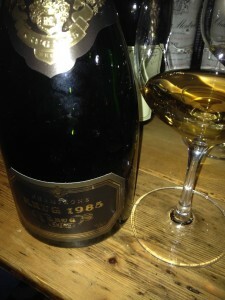 It represents all what one wants from Champagne – and more. 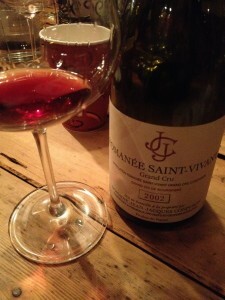 Purchased on release, and kept in a cold cellar, this wine is just fine today. Combines opulence with vivacity. It has lime/lemon focus, that typical Dom Perignon toast/pain grillé aspect that makes you seek further sipping. There is a mid palate richness that falls into a fine line of precision on the finish, which is long. 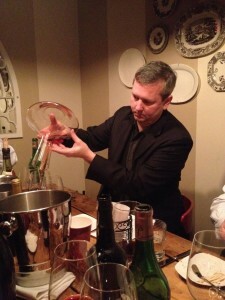 The bottle was emptied fairly quickly among the 8 dinner participants. A pair of beauties from the 1970s. David Zimmerman holding a pair of beauties. This was really quite tasty. Special praise is due to the staff, service and cuisine at Ripple. Ken Brown organised this for us and he chose wisely. A great pre fixe menu prepared by chef Marjorie Meek-Bradley was great. I loved the charcuterie and cracker like bread. Then came a delectable short rib ravioli with oyster mushrooms and clothbound aged cheddar. The aforementioned main course was accentuated with truffled sunchoke purée. 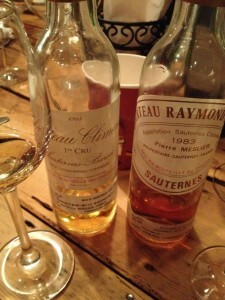 We also had a great cheese plate including some blues that went well with the Sauternes/Barsac. The service was responsive (we asked for decanters, buckets etc) and the stemware excellent. 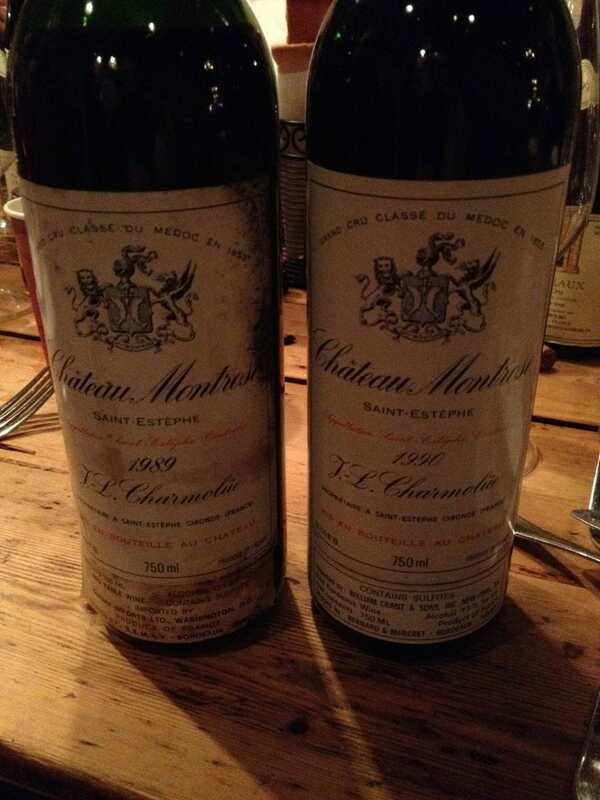 So a great evening for all concerned – and hopefully useful for those readers who have these bottles in their cellars.